This name was removed by this person's request. Found her on the 1860 Blount, Tennessee census (dist 8 img 4) as Susan Carpenter age 36. Found him on the 1880 Maple Creek, Outagamie, Wisconsin census (dist 122 img 12) age 7. Found him on the 1900 Maple Creek, Outagamie, Wisconsin census (dist 91 img 4) age 27. He is single and a servant in the household of (?) Hoffman. Found her on the 1910 Maple Creek, Outagamie, Wisconsin census age 37. His widowed mother-in-law Mary A. Finger age 62 is living with his family. Found him on the 1920 Maple Creek, Outagamie, Wisconsin census (dist 221 img 2) age 46, farmer. Father, mother born Germany. Found her on the Greenfield, Highland, Ohio census (img 22), age 16, born Ohio. Found him on the 1870 Benton, Yates, New York census (img 40) age 17. Found him on the 1900 Gorham, Ontario, New York census (dist 66 img 2) age 47, bartender. The funeral of Mrs. John Littleboy was held at the M. E. church last Tuesday afternoon. Mrs, Littleboy has lived in this place for over a year and was well liked by all who knew her, and many friends will mourn their loss. Death came as a relief, as she had been a very great sufferer for many months past with cancers and her daily prayers were that she might die, as she suffered untold agony. She is survived by a husband and three children, two girls and one boy. They are Ina and Ella Littleboy and Willie Littleboy. Found her on the 1880 Hastings, Oswego, New York census (dist 238 img 7) as Cornelia Blankman age 22. Found her on the 1900 Cicero, Onondaga, New York census (dist 40 img 14) as Cornelia Littleboy age 41. Found her on the 1870 Starrville Beat, Smith, Texas census (img 14) as Candas Cancellor age 5. Found her on the 1880 Precinct 1, Wise, Texas census (dist 125 img 35) as Candace Cansler age 14. Found her on the 1920 Justice Precinct 1, Collingsworth, Texas census (dist 30 img 11) as Sarah C. Crone age 55, widow. Found him on the 1920 Dallas Precinct 3, Dallas, Texas census (dist 156 img 5) as Marcelle DeManche age 5. Found him on the 1930 Waco, McLennan, Texas census (dist 33 img 32) as Maclla John DeManche age 15. Read the account of his marriage with his wife's data. Found him on the 1915 Canandaigua, Ontario, New York state census (dist A.D.01 E.D.02 img 7) as Alfred H. Dewey, Jr. age 2. Found him on the 1920 Canandaigua, Ontario, New York census (dist 68 img 8) as Alfred H. Dewey, Jr. age 6. Various spellings have been found, Alline, Alleen, Allene. Found her on the 1930 Houston, Harris, Texas census (dist 26 img 20) as Aleen Finger age 9. Found her on the 1940 Houston, Harris, Texas census (dist 258-230 img 17) as Alline Finger age 19. The engagement of Miss Ethel M. Finger has been announced by her parents, Mr. and Mrs. Peter Finger of 3 Mohawk St, Green Island to Robert J. Kelly, son of Mr. and Mrs. Eugene Kelly of 864 Hoosik Rd. Miss Finger is a graduate of Heatly High School. Her fiance attended the same school and both are employed at the Marshall Eclipse Division of the Bendix Aviation Corp.
Found him on the 1920 Oconto, Oconto, Wisconsin census (dist 169 img 15) as Frank Finger age 7. He is living in the houshold of his step-father Anton Chezek. Found him on the 1940 Oconto, Oconto, Wisconsin census (dist 42-21 img 5) as Frank Finger age 26. Shovels Gravel WPA Project. He is living in the houshold of his step-father Anton Chezek. She is referred to as Miss Henrietta Finger of Brooklyn in her sister Mabel's obituary. - 1938. Found her on the 1900 Saugerties, Ulster, New York census (dist 132 img 9) age 14. Found her on the 1910 Saugerties, Ulster, New York census (dist 164 img 32) age 24, single. Found her on the 1910 Saugerties, Ulster, New York census (dist 164 img 32) as Henrietta Finger age 24. She is single and living with her widowed mother Viola Finger age 59. Found him on the 1900 Justice Precinct 2, Hall, Texas census (dist 9 img 3) as Henry A. Finger age 16. Found him on the 1930 District 20, Rutherford, Tennessee census (dist 28 img 12) as Julian A. Finger age 22, nephew, living in the household of Walter Wiggs age 48. Found him on the 1940 Other Places, Davidson, Tennessee census (dist 19-22 img 33) as Julian R. Finger age 32, farm laborer. Found her on the 1930 Florence, Florence, Wisconsin census (dist 5 img 29) age 10. Found her on the 1860 Livingston, Columbia, New York census (img 43) as Mary Fingar age 1. See her on the 1870 Livingston, Columbia, NY Census, age 10. Found her on the 1900 Clermont, Columbia, New York census (dist 10 img 5) as Mary Moore age 41. Has given birth to 2 children, 2 are living. Found her on the 1900 Pacific, Franklin, Missouri census (dist 26 img 21) as Stella Fanger age 5. Found her on the 1910 Meramec, Jefferson, Missouri census (dist 35 img 13) as Stella Finger age 16, granddaughter in the household of Samuel Finger. Found her on the 1910 Danbury Ward 1, Fairfield, Connecticut census (dist 61 img 15) age 1. Found her on the 1920 Danbury Ward 2, Fairfield, Connecticut census (dist 101 img 6) as Freda M. Haitsch age 11. Found her on the 1930 Danbury, Fairfield, Connecticut census (dist 102 img 14) age 21, single, hair dresser, beauty parlor, living at home. Found him on the 1880 (not stated), Tarrant, Texas census (dist 92 img 1) as Lewis C. Harrison age 20, single, living at home. Farm hand. Found him on the 1900 Pryor Creek, Cherokee Nation, Indian Territory census (dist 24 img 2) as Lewis C. Harrison age 40, dealer, hdw. Found him on the 1910 Pryor Creek Ward 4, Mayes, Oklahoma census (dist 86 img 2) as L. C. Harrison age 50, county clerk, court house. Found him on the 1920 Pryor Creek, Mayes, Oklahoma census (dist 56 img 23) as Lewis C. Harrison age 62, clerk, county. Found him on the 1930 Pryor, Mayes, Oklahoma census (dist 15 img 5) as Lewis C. Harrison age 70. Found her on the 1940 West Allis, Milwaukee, Wisconsin census (dist 40-91 img 45) as Carol Hochmuth age 6. Found him on the 1850 Saugerties, Ulster, New York census (img147) age 4. Found him on the 1860 Saugerties, Ulster, New York census (img14) age 14, living with his brother Peter and his wife. Found her on the 1870 Caldwell, Catawba, North Carolina census (img 21) as Mary England age 24. She, her husband and 3 children are living with her parents Elisha and Eliza Ramseur. Found her on the 1880 Davidson, Transylvania, North Carolina census (dist 186 img 13) as Mary England age 32. 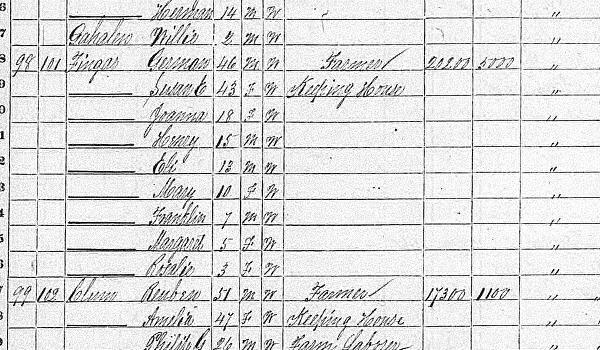 Found him on the 1860 (not stated), Lincoln, North Carolina census (img 68) as John Rudisill age 10. Found him on the 1900 Buffalo Ward 14, Erie, New York census (dist 107 img 15) as Felix M. Scherer age 7. Found her on the 1880 Artesia, Iroquois, Illinois census (dist 120 img 1) age 7. Found him on the 1910 Salina, Onondaga, New York census (dist 87 img 36) as Martha Weber age 28, single, living at home. Found her on the 1920 Salina, Onondaga, New York census (img 18) as Martha Schiesser age 38. Came to the U.S. in 1892. Found her on the 1930 Salina, Onondaga, New York census (dist 182 img 2) as Martha Schiesser age 48. Found him on the 1860 Conway, Izard, Arkansas census (dist 2 img 2) age 6. Found him on the 1900 Germantown, Columbia, New York census (dist 13 img 34) as Byron J. Yager age 10.